Check out this joke book for young laughers everywhere. It’s JUST FOR KICKS! 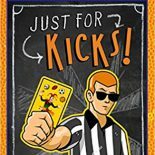 : 600 KNOCK-OUT JOKES, PUNS AND RIDDLES ABOUT SPORTS. Your young readers will score more than a few laughs with this original collection of game-winning shots. How does Santa Claus kick a football? With his mistletoe. What does T. Rex eat while camping? Why can’t two babies play basketball? So, exercise their funny bone with this gut-busting book! MONSTER MADNESS! 600 FRIGHTFULLY FUNNY JOKES, PUNS & RIDDLES makes its way to the shelves. It’s a scream. What do you call mummies in the desert heat? Mummifried. How does a zombie feel after he loses his lunch? Brainless. What do you call a team of vampire superheroes? The Fangtastic Four. John Briggs is both a former sports reporter and veteran stand-up comic who has written jokes for TV, radio and print. In addition to thousands of shows across the country, he was one of the warm-up acts for HBO’s Young Young Comedians talent search.